If you have a missing tooth or even if you have many teeth missing, then dental implants treatment may be able to help you regain the feel of your natural fixed teeth again. Up until a few years ago dental implants were not as popular as they are today. Dental implants treatment prices have come down to a more realistic level and it has allowed many more patients to be able to afford this amazing form of dentistry. Firstly lets discuss some basics. The dental implant is made of a metal called titanium and it is usually cylindrical in shape.Dental Implants were discovered in the Sweden by Professor Branemark. The dental implant is placed in the jaw bone during a short procedure which can be undertaken under local anesthetic or sedation. Dental implants are one of the most predictable and viable alternatives to missing teeth as they are almost 95% successful all of the time. This means that there is only a very small 5% chance of dental implants not working. Even if the implant does fail it is often possible replace the failed implant with another implant after a suitable healing period. Dental implants are used for single or multiple teeth replacement. 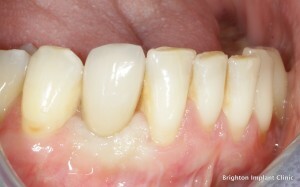 The first stage in the dental implants treatment process is an initial assessment. During this appointment the implant surgeon will assess the quality and suitability of the jaw bone for dental implants. Radio-graphs and CT scans may be needed in order to make an accurate assessment of the jaw bone prior to surgery. Dental implants are placed by implant surgeons who have additional training in surgery in order to place dental implants successfully. 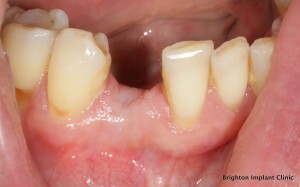 After the dental implant is placed it is left for about 3-4 months to heal. During this phase the dental implant fuses with the jaw bone. 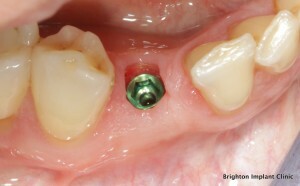 Once the healing phase is complete, the dental implant is ready for the next stage of impression taking. Accurate and precise impressions are taken of the healed implants and the surrounding tissues. These impressions are then sent to the lab where the final dental crown or dental bridge are made. 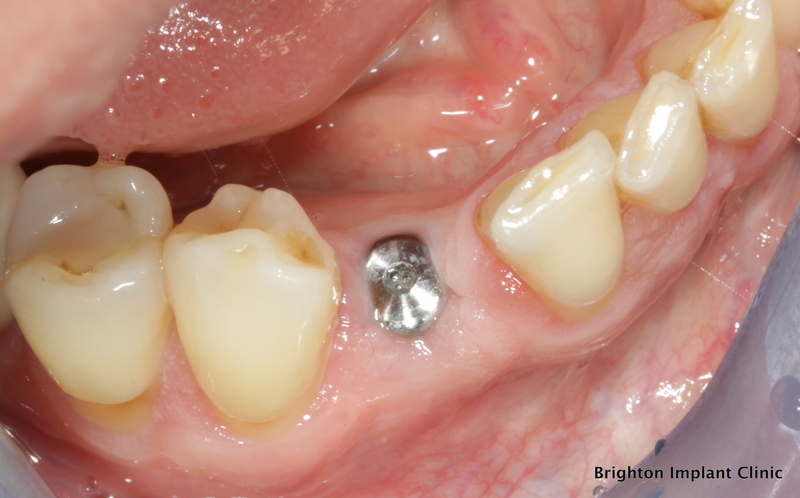 Many of the crowns which are now made on dental implants are metal free. Stronger porcelain materials and zirconia have made it possible to have highly aesthetic natural looking implant restorations. Finally once the implant dentist is happy with the accuracy of the impressions and the fit of the metal framework, the restoration is completed with lifelike natural tooth colored porcelain. Brighton Implant Clinic has its own dedicated dental implants laboratory where we make each and every dental implant restoration for our patients. 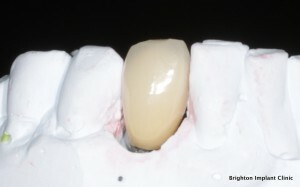 The restoration is then secured onto the dental implant by means of a screw or cement retained mechanism. For more information about Dental Implants Treatment please feel free to Contact Brighton Implant Clinic or Call us on 0800 111 6623 .